we are leading manufacturer of rubber seal strip and rubber edge trim,we can production epdm rubber strips and door rubber seals for you with good quality and price. 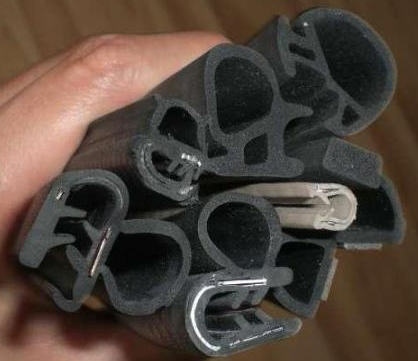 Epdm solid rubber and sponge rubber co-extruded. Use: universal truck weatherstrip, container weatherstrip, boat hatch seal, automotive weatherstrip, door seal etc. Application: avoid dust, water & air to leak inside the cabin. The same sealing system is also used in Deck lid sealing, bonnet sealing and similar other applications. Rubber or PVC material produced. Black, Red, White, Gray etc different color available. Epdm rubber material extruded and Flock covered. Easily bent to form a U shape. Plastic clip with different color like white , red, blue, black etc.